Everyday Superheroes was borne as part of a Kickstarter project. Its goal is to help raise awareness of women in STEM (Science, Technology, Engineering and Mathematics) fields. 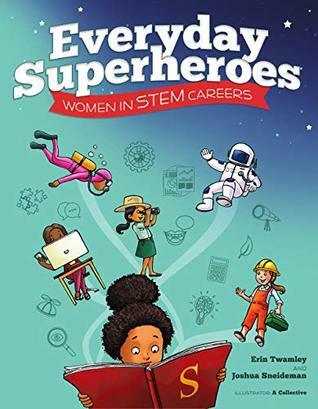 A picture book targeting primary grades, it offers twenty-six women (cute alphabetical organization) who have made major contributions in STEM fields. Ranging from the well-known (Eugenie Clark) to the less well-known (Lyndsey Scott), each of the women featured has a short biography and an explanation of their field. Twamley also provides a discussion of the gifts that are the hallmark of those who are drawn to the STEM fields- observation, imagination/curiosity, problem solving, collaborative abilities, data-based analytical thinking, and communication skills. If you have a daughter, a granddaughter, a niece, a goddaughter, or if you simply know a female child who shows an interest in science, building, or technology, this is a wonderful book for her. Twamley and Sneideman show twenty-six women who have achieved success in their fields and who provide an optimistic outlook for the women STEM researchers of our future. You can check out the book here on Amazon or learn more over on Kickstarter. I received a Digital Review Copy of this book in exchange for an honest review. Sign into Goodreads to see if any of your friends have read Everyday Superheroes.